Today we live in a world where discouragement battles encouragement. Learning ways of constructive achievement help with internal and external strife . Self realization is an important step in helping people with their own identity and voice. The visual and audible arts are age old methods of self expression. From early times in history the drum has been used as a healing tool. Rhythm is relevant from the basic structures of language i.e.. Enunciation to exclamation. Rhythm exists in everything! Today, a new wave of rhythm culture is sweeping across the world, effecting all ages, races, and all factions of society. Rhythm is an awakening of creativity and enlightenment and completely accessible to all. Many people say that they donÕt have rhythm. But with a deep breath and a moment of self analysis one can hear the rhythms inside and the world around. There are many paths of achieving rhythmical bliss. Listen to your heart, hear its beating, then express it! Clap your hands, stomp your feet, grab a pot from the kitchen or a bucket from the street and make rhythm. Like meditation, drumming helps with self realization, and in developing interdependent relationships. From the first symbiotic relationship between mother and child, our hearts have been part of the orchestra of life. Beginning from the most inner microcosm to the furthest cosmos science has been measuring rhythm and time. Doctors record and study the rhythms of our bodies through the heart, brain, muscles, etc. Drumming has been acknowledged for its positive healing effects, and improving the immune system. In fact, there are studies being and done about its astounding impact in the treatment for Cancer, AlzheimerÕs Disease, Multiple Sclerosis and ParkinsonÕs Disease. Drum circles varied uses extend from community celebrations to healing programs that work with all levels of participants. Drumming can relieve stress and has been proven to develop the sense of community, it lifts spirits, increases curiosity, and stimulates a positive interactive environment of intrigue. One common way to develop this is the assembly of a Drum Circle. 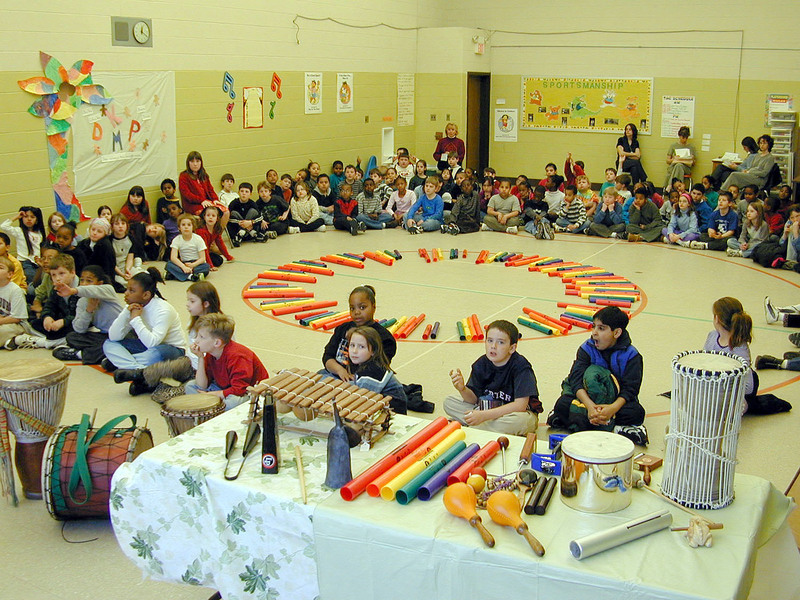 A Drum Circle is composed of various found sounds, drums, percussion instruments, and vocals. Everybody drums in a musical endeavor, without manipulation. Drum Circle Facilitators rise to the service during transition points in an effort to re-focus the group, empowering the individuals and group through rhythm. Large an small companies like Remo, and All One Tribe are birthing in the music therapy community, producing instruments that are valuable tools of self expression. Taking into considerations the various age groups, and levels of health, these companies have been producing instruments that are durable, and easy to use. Drums come in all shapes, sizes, and weight. Some drums are completely synthetic, while others are hand crafted as they were thousands of years ago. ItÕs important to find the right instrument for yourself and to feel connected and grounded. Through group drumming, individual internal rhythms synchronize with the entire group. In a group sessions people are empowered and stimulated through the voices of the instruments. Energy swells as participants share joyful bliss conversing through a dance of sound. From the two hands of a hand drummer to the pulsating clap of an energized crowd, there is a call and response between participants. Drum circles are popping up all over the world, creating informal social gatherings of an eclectic mix of society. Sometimes as small as 4 people to large groups of hundreds to thousands, a community is formed through the use of sound. Locally (Fredericksburg) drum circles are held regularly at Eyeclopes Studios, Libraries and in local parks. People bring their own instruments, or use ones provided at the gathering. Some drum circles are culturally specific, i.e. West African or Middle Eastern inspired, generally though, drum circles are just plain fun. Rhythm is a Dance! Its open to interpretation, one should not fear or discourage its powerful effects. One should embrace it, nurture, and watch it grow. Its flowering everywhere and changing all the time. The healing paths of rhythm, are documented through articles, books, CDs, and the Internet.